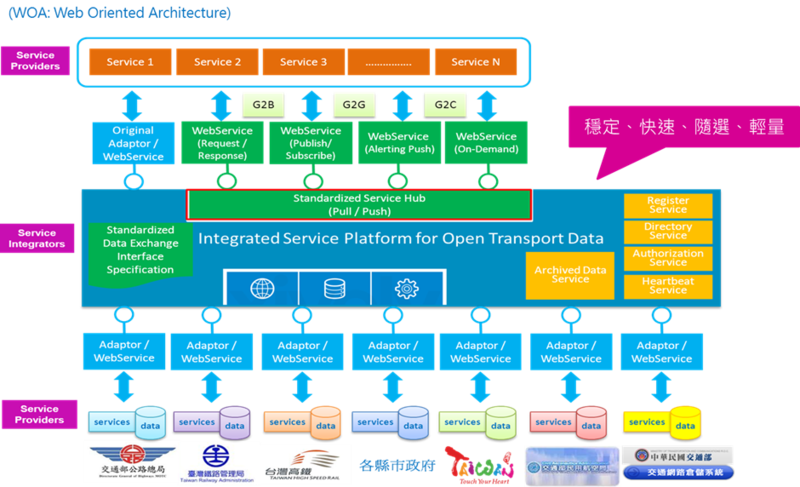 To accelerate the integration of public transport information Open (Open Data) policy, the activation of industrial value-added applications, the Ministry of Transportation and Communications eagerly develop the Public Transport Data eXchange, PTX. Hoping with a cross devices, cross areas, and M2M standardization of public transport information exchange mechanism platform can meet the future need of citizens and industry networking environment. 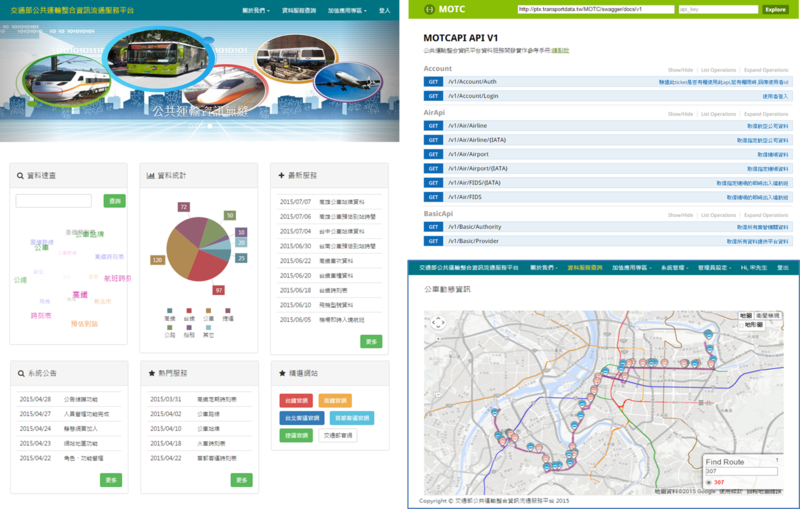 PTX platform is web-service-oriented information architecture that based on mutual cooperation with various public transport agencies intermediary platforms; data covers highways, railways, aviation and shipping information. It includes industry, routes, stops / field station, time tables, fares, route line, estimated arrival time. Raising standard by OData (Open Data Protocol) standard interface to provide quality, and open information API. Developers using OData defined access for on-demand, effectively reducing the cost for value added service providers. Value-added industry, academic institutions, government agencies, community and people can easily access data through PTX platform for the implementation of a common purpose shared the public transport information. 1. Taiwan Railway: station basic information, basic information on the trips, the train kind of information, 45 days schedule. 2. The high-speed rail: the station basic information, basic information on the trips, 28 days schedule. 3. Civil aviation: Airport information, airline information, aircraft data, flight information display data (FIDS). 4. Public highway bus and six metropolitan bus (Taipei, New Taipei City, Taoyuan City, Taichung, Tainan, Kaohsiung) static data, route information, stop sign information, dynamic bus timings car machine data (A1) , fixed vehicle computer data bus (A2), the estimated bus arrival time (N1).